This would not be possible without all of the readers that have stopped by one of my blogs during the past three years or so – without you guys, buying this car would NOT have happened. Now, to the "How Much Money Are you Making By Blogging" question that I’m sure most of you are thinking. I will not get into specifics, but I will say that my car payment (60 month loan) is covered by the amount of income I generate from all of my blogs. And the good news is that each year that income continues to go up. 1. http://MustHaveGizmos.pgpartner.com - this is my comparison shopping website with PriceGrabber co-partner program. Best online prices you will find! Check this site out before your next purchase. It also serves as a great product resource. This is my primary income from blogging. I use product price comparison technology. 2. http://MustHaveGizmos.com – I use product price comparison banners, Google AdSense, BlogAds and I sell independent ad space/sponsorship. 3. http://OuthouseRag.com Humor site that I use Google AdSense and a little ad placement/sponsorship, and a very little price comparison banners. Now much do I spend each month? Not much! I have a TypePad Pro account ($149 a year) and 4 domains ($19.95 every 2 years, each). In total, I spend under $200 a year. I do not advertise my blogs, so my traffic comes from search engines, links from other blogs/websites, and by word of mouth. Thanks! 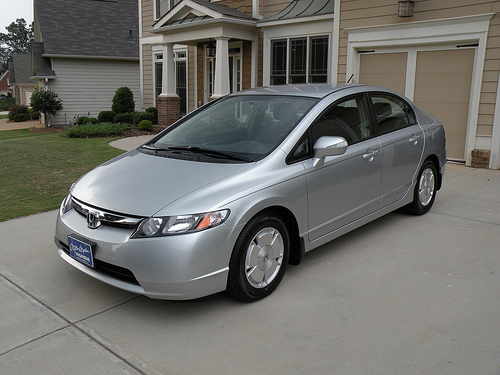 Why did I choose a Honda Civic Hybrid? I worked the numbers. I know that the cost of the hybrid car will not be entirely made up by the additional gas economy any time soon. I bought the car, not just to save money, but to do my part in helping save our earth, and lower my consumption of resources. Let me explain. The cost difference between the non-hybrid Civic and the Civic Hybrid, with equal options, is around $3,090. If gas is $4.00 a gallon, the hybrid at 45+ mpg fuel economy, will save me at least 9 cents a mile. That's 9 cents less than what I was getting with my old car (23 mpg.) 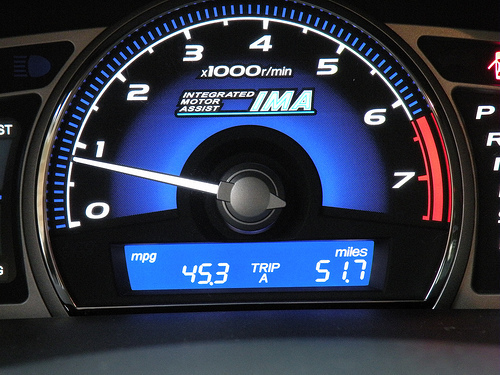 A non-hybrid Civic, at 35 mpg, would have still saved me, at 7 cents a mile. Therefore, I will need to drive 154,500 miles to make up the difference in the price in choosing a hybrid! Even though it could be a long time before I make up that difference, I feel real good knowing that I’m doing my part to help save a little of the earth’s resources! this car is so good. i bought one two months ago. i bought this car 2 months ago. i just love eveything about it. Hello I’m a huge fan of Outhouse rag and I thought I’d shoot you this weird Ebay item that was posted today!! It’s a turtle that has the Jesus shroud of turin image on it?? Ninja Turtle Jesus. How about sharing the wealth (and maybe the visitors :P )? I forgot you have that comparison shopping website (http://MustHaveGizmos.pgpartner.com). Last week, I bought the Nikon p80 at the Mall of Georgia Best Buys store and paid $391.40 after tax. Now I see on your site that I could have bought it for $338.90 including free shipping and no tax! I could have saved $52.50. Hell, I could have bought an Adata 16GB Turbo Secure Digital High Capacity Card with it and still saved money. By the way nice job with your sites and your new car. Nice car. Congrats. Now, watch out for bowling balls and beer bottles that might be flying around on I-85 in the afternoon. Also, I expect you to keep this one cleaner than your last. You couldn't pick a better car and for the right reasons. Love your blog.